Cosmic rays are particles that streak through the universe at near-light speed, colliding with giant balls of gas. But their origins are shrouded in mystery. Now physicists have uncovered an important clue about where these superfast particles come from. Physicists used the Fermi telescope to examine how cosmic rays behave when they slam into giant balls of gas that are remnants from supernovas. Cosmic rays are mostly protons, and when they smash into these remnants, they are bounced around by magnetic fields and produce gamma rays. The video below dramatizes what the Fermi saw, looking at different kinds of emissions from three middle-aged supernova remnants called W51C, W44, and IC 443. Scientists compared these emissions to those from relatively young supernova remnant Cas A, which is 330 years old. 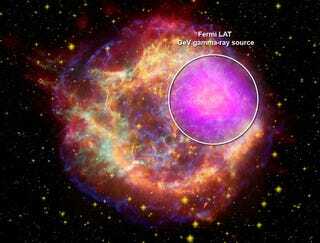 Young supernova remnants seem to possess both stronger magnetic fields and the highest-energy cosmic rays. Stronger fields can keep the highest-energy particles in the remnant's shock wave long enough to speed them to the energies observed. "We think that protons accelerated in the remnant are colliding with gas atoms, causing the gamma-ray emission," Funk said. An alternative explanation is that fast-moving electrons emit gamma rays as they fly past the nuclei of gas atoms. "For now, we can't distinguish between these possibilities, but we expect that further observations with Fermi will help us to do so," he added. Either way, these observations validate the notion that supernova remnants act as enormous accelerators for cosmic particles. So it would appear that supernova remnants are the source of ultrafast cosmic rays. They may not be the origin of these freakishly fast protons, but they are definitely speeding them up as they pass by. Now we know where cosmic ray harvesters will need to park to capture their quarry.